Smiling is my favorite yoga pose. It makes me feel better and puts a smile on others’ faces, too. It’s a natural mind-body and body-mind happiness booster. When you’re happy, you typically smile and your whole body responds by releasing a cascade of feel-good hormones. What’s also interesting is that even when you are not happy, and you smile, you can trick you brain into thinking that you’re happy, and will start releasing the same feel-good hormones as if you were truly happy. That is why smiling is both a mind-body and a body-mind technique that we can use to add more positivity into our daily life. Smiling, as you may know, is contagious and conveys so many nice feelings to others who are lucky enough to see it. The words to an old song said it all. “When you’re smiling, when you’re smiling, the whole world smiles with you.” There is research on smiling that has revealed many interesting bits of information that will surely make you do it more often. Here are five simple facts about smiling that can help you look better and live longer. Smiling boosts your mood and increases your sense of well-being. Dopamine, serotonin, and endorphins get released and make you feel very good. Next time you want to feel better, smile. This action will trick your brain into thinking that you feel happy and it, in turn, will start releasing feel-good hormones to match it. Smiling makes you look younger. People who smile are perceived as looking years younger than those with a frown on their face. If you ever want to look younger than your age, smile more. Smiling makes you look thinner. People who are frowning are also perceived as looking heavier than those who are smiling. Smiling seems to portray people as healthier and thinner. If you want to look slimmer, be sure to smile more. Smiling can predict your life span. Researchers studied old baseball cards. It was found that baseball players who had big smiles on their face lived longer than those who did not have big smiles on the pictures. Professional players who had beaming smiles lived approximately seven years longer than their counterparts. Smiling makes you look friendly and kind. Experts determined that people who smiled were perceived as being better natured than those who didn’t. People who did not smile were thought of as being unwelcoming. These are just a few fun facts about smiling that I hope will brighten your day. Next time you want to feel happier, look younger and thinner, and appear friendlier, flash your pearly whites. Because if you do, you might just live longer. Smiling can make someone’s day, too. If you are around people who are stressed and overworked, try giving a nice warm smile to show your support and concern. It’s a gift that keeps on giving. Best of all, it’s free! Who knows, your smile could just be the best thing that could happen to them that day. To learn more about how we can work together visit www.HealthandHappinessSpecialist.com. Did you know that this month is not only a month for celebrating Valentine’s Day but also for performing a Random Act of Kindness? In the spirit of love and kindness this month, I want to share with you some wise words of wisdom that were given to me by my mindfulness muse during a meditation. I suggest that you read it a couple of times and think about the phrases that speak to you. Once you are done reading, pick a phrase, and play with it for a day. Be creative and have fun with it. As you practice one of the mindfulness techniques, notice how it makes you feel. If you like what you have chosen, repeat it for another day or two. When you feel ready to try another one, read over these Words of Wisdom again and repeat the same process. 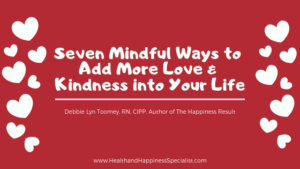 Here are seven mindful ways to add more love and kindness into your life. This month, I encourage you to give it a go and tune into how much more love and kindness it brings into your day. There is such depth in these seven phrases that each one of them can become a month-long mindfulness practice in itself. Here is what they mean. 1. Watch your words – Think about what you are going to say before you say it. Use your mental filter to avoid hurting someone’s feelings and regretting what you have said. 2. Listen to your gut – Tune into your gut instinct and intuition. They are the radars that keep you informed about everything and everyone. 3. Question your mind – Just as your gut tells you the truth, your mind can play games with you. Ask your mind what is really, really, really so. You are not your thoughts. 4. Speak from the heart – When you speak, allow it to be heartfelt. Words that come from the heart, speak volumes about your intentions. 5. Turn up your lips – Smile – period – Smiling can brighten everyone’s day. Smiling is very appealing and attractive too. 6. Extend your hand – Help others. One of the best ways to make yourself and others feel better is by doing a kind deed. 7. Move your feet – One of the best ways to decrease stress and improve your health is by being active. Call a friend or family member and ask them to go for a walk with you. I hope you enjoyed the Words of Wisdom from my mindfulness muse. I certainly do. To learn more about ways to gain more love in your life, get my book, The Happiness Result. I created my book for today’s busy people to help them pick and choose seven simple techniques to create an awesome life. Go to www.TheHappinessResult.com to get your copy. 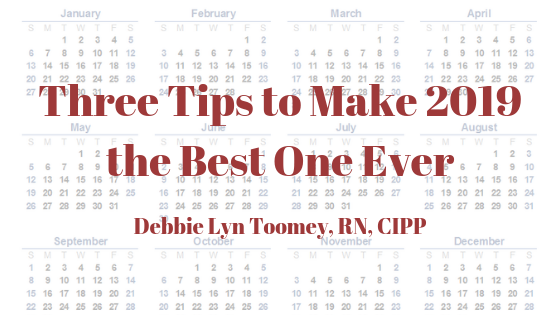 Are you ready to make this year one of the best years of your life? I know 2019 is going to be one of the best years ever. I can just feel it in my bones! I am serious. Do you know how I know that? It’s simple and it all boils down to one word, manifestation. Nope, I am not on drugs. I am just high on life. In my 52 ½ years on this planet, I realized early on that we have the power to create, attract, and receive good things in our lives. We are manifestors. Our thoughts do create our reality. While some might call it the law of attraction, I call it the law of manifestation. I love teaching manifestation in my workshops because it is fun and powerful. Last year, I held an online Manifest Tribe meeting and by the end of the four weeks of manifestation everyone met their goals. How? Because I taught and coached them how to believe in their vision and to expect it to happen. While we did cover more during our group calls, the essence of our time together was to teach the group how to take control of their lives by being active manifestors. You see, while we cannot control everything that happens in this world, we can control how we choose to view things and how to respond to things. Here are three tips on how you can begin to manifest good things in 2019 so that it can be one of the best ones ever. Want – Know what you want. If you don’t know what you want, how do you expect to find it? Too many people are walking aimlessly around, looking for something that might peak their interest. Stop “window-shopping” in life. The best way to get the best deal is to know what you are looking for. Need – Know why you need it. Ask yourself if you really needed it. What is lacking. What will happen as a result of you getting what you are asking for. Be honest with yourself. The more you can be honest with yourself, the more you will learn why you need it. Manifest – Know that you have the power to manifest. You can make things happen. Once you determine what you want and why you need it, then you can play with the energy of manifestation. Visualize what you want and how it will feel to have it. Believe that you can have it and you are worthy of it. Expect for it to come into your life. Do this exercise as often as you can until it becomes a routine. I hope you enjoyed these three tips. I also hope that it helps make this year one of your best ones ever. If you need a way to keep motivated this year, get my book Goals, Gratitude, and Success Journal. This was the book that my Manifest Tribe group and I used during our time together. You can go to www.TheHappinessResult.com to get your copy. Now is the perfect time of the year to get this life changing book. Have you started your holiday shopping yet? I have. I started last August. I am a planner and love to stay on top of my holiday shopping so that I don’t feel pressured to do it at the last minute. I hate feeling overwhelmed by doing something that I love. There’s no fun in that at all. Just in case you are starting to feel panicky that the holidays are around the corner, don’t worry. I got your back! I have taken regifting into a whole new level by giving you the top five 2018 tips that I sent you this year. I hope that this small package of practical tools can help you have a healthier and happier holiday season. Starting from the bottom. Here they are. 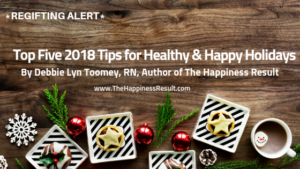 Tip # 5 Self-Compassion (April, 2018) – Give yourself kindness, love, and compassion this holiday season. If you had goals that you did not reach this year, give yourself a break and allow them to be goals for 2019. Instead of reflecting on what you didn’t achieve this year, think about the goals that you did reach. Give yourself a pat on the back and a hug for all that you have achieved this year. Tip # 4 List (May, 2018) – The best way to have a successful day is by planning ahead. Creating a wish list of things-to-do can become overwhelming. Once you have allowed yourself to go crazy writing down your items. Look at them again and ask yourself which ones you will really do that day. Asking yourself this powerful question is a game-changer. You’ll be happy to see your list go from daunting to doable. Tip # 3 “I Get to” vs. “I Have to” (March, 2018) – It’s amazing how quickly our attitude and experience changes when we switch inner talk from “I have to” to “I get to”. This simple and strategic change can help you do something that you didn’t feel like doing to doing it with more gusto. Tip # 2 Gratitude (June, 2018) – One of the quickest ways to boost your happiness is through gratitude. Gratitude can help you clear the holiday blues by thinking about all that you have such as, clothes on your back, a friend to talk to, or food in your fridge. If you can’t think of what to be grateful for, then you are not looking hard enough. 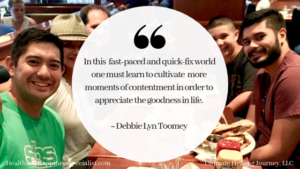 Tip # 1 Contentment (October, 2018) – If you don’t feel like striving for a holly jolly holiday this year, don’t worry. Try going for contentment instead. There is great peace, grace, and blessings when you are feeling content. Think of activities, people, places, and food that can bring about contentment for yourself. Try doing something different for yourself every week and notice how you feel. I hope you enjoyed these regifting tips. I know I will. They’re fantastic reminders for anyone who can get caught up in hustle and bustle of the season. If you find a practice that you like, continue it for 30 days. That way you can ring in the new year on healthier and happier note. If you need coaching to help you reach more goals, contact me at info@HealthandHappinessSpecialist.com. If you are looking for a book that can bring about many happiness results, get a copy of my book, The Happiness Result – More time, More health, More love, More success. Go to www.TheHappinessResult.com to purchase your copy today. Don’t you just love getting snail mails from people you care about? Here’s a no-cost way to make this Thanksgiving a truly happy one for you and someone special in your life. It’s a gratitude practice that not too many people know about. It’s called a “gratitude visit”. Gratitude is more than saying thanks. 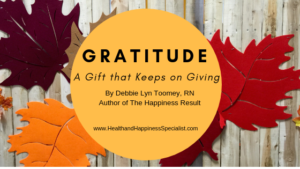 According to the study by Martin Seligman, past president of the American Psychological Association, a gratitude visit is a moving way to express your deep appreciation and gratitude to someone who has made a big difference in your life. The gratitude letter gives you a chance to write down the positive feelings that you have always wanted to share with a person. When you are done writing this heart-felt letter, personally deliver it and read it out loud. Taking the time to write, deliver, and read your gratitude letter has been proven by Seligman’s research to have positive results for many months. Both you and the receiver will benefit greatly from this unique and powerful exercise. Here’s how you can get started in your very own gratitude visit during this holiday season. 1. Think of someone that positively influenced you in your life. 2. On a piece of paper, write down how grateful you are about having him or her in your life. Write down what you’ve always wanted to say to that person. 3. Continue by writing down what has happened. 4. Write down as much as you can. 5. Don’t worry about grammar or punctuation. 6. Notice how you feel after writing the letter. 7. Call the person and let him or her know that you want to stop by. 8. Deliver the gratitude letter in person. 9. Read the whole letter slowly to that special someone. 10. As you are reading, pay attention to the reaction of the receiver. 11. Notice how you feel afterwards. 12. Pay attention to your level of positivity in the coming weeks because of the gratitude visit. If you need coaching support in how to add more happiness and gratitude into your life, contact me for at info@HealthandHappinessSpecialist.com. 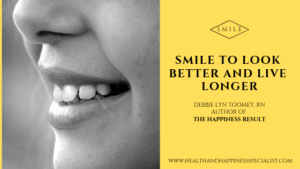 Also, if you are looking for ways to live your best life, be sure to visit my website www.TheHappinessResult.com to get a copy of my book The Happiness Result – More time, More health, More love, More success. You’ll be happy you did. I was recently one of the keynote speakers for the Vermont Reiki Association. I had a fantastic time. The people at the conference were all so wonderful and I got to talk about my favorite topics. In my keynote, I discussed how positive psychology and character strengths made me happier and how they enhanced my Reiki self-practice. Later on, in the breakout session, I shared with the attendees how my top strength, gratitude, helped me cope with stress and how it deepened my relationship with my family. Gratitude is such a powerful practice. It’s like a gift that keeps on giving. What is gratitude? Robert Emmons, considered the father of the science of gratitude, defines it as “a felt sense of wonder, thankfulness, and appreciation for life.” In other words, it’s more than just saying thanks. Many studies have proven that gratitude can help with physical and mental health, increase self-esteem, and improve sleep. I have experienced that the grace of gratitude can fill you up with a rich blend of positive emotions. What’s amazing about that is that not only does it make you feel good, it makes others feel good, too. How? Well, when you are in the state of gratitude, a warm and heartfelt feeling of appreciation bubbles up inside you making it easier to do kind deeds for others. The “just because” nice gestures happen naturally, making you happier and more social. The precious gift of gratitude and all it has to offer makes it an inviting practice to do. Now that we are about to enter the holiday season of Thanksgiving, I challenge you to find as many things to be grateful for. Here’s how you can start a simple gratitude practice, one that is a gift that keeps on giving. At the end of the day, think of 3 good things that you were grateful for. Write them down in a notebook or a journal. Explain why you were grateful for each of them. Notice how you feel after you are done writing. Pay attention how your practice benefits others around you. Try this for 30 days and be prepared to receive all the blessings that come with this special practice. While anytime is a good time to start this life changing habit, this month of Thanksgiving is a perfect one. Try it today and see how much happier you are just because you started a gratitude practice. 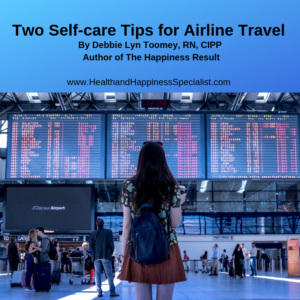 If you need more support and coaching on how to live your best life, contact me at debbielyn@healthandhappinessspecialist.com today. To get more ideas on how to boost your level of happiness, get a copy of my book, The Happiness Result. This book is the perfect holiday gift for anyone you care about. Visit www.TheHappinessResult.com today. Last Saturday was a typical bone chilling and drizzly October day in New England. My family and I committed to attend a friend’s surprise 40th birthday party. Unfortunately, instead of the party being indoors, it was held outdoors in a medieval attraction park. Surprisingly, the parking lot was filled with cars. Coming out of some of them were kings, princesses, and fairies who traveled far and wide. As we entered the park, the gloomy day quickly turned in to a great one. I saw people proudly walking around dressed as their fantasy characters. Although they were in a costume, their real selves shined through. It was as if their make-believe outfits allowed them to embrace their authenticity. It was a magical wooded scene. Everyone was having fun and freely expressing themselves as their favorite medieval persona. The shops were bustling with both first timers wanting to find the perfect piece to wear and old timers looking for yet another article to add on to their already elaborate attire. While I saw some men who wore armors and capes, others wore tiaras. Likewise, while some women wore gown and tiaras, others wore pirate outfits with swords. The customs transcended gender, age, and culture. Everyone was accepted. Everyone became a part of the theme. Everyone was free to be themselves. It’s easy to pretend and express who we are by wearing costumes especially when everyone is doing it. But how can we do that in real life without playing a character? That’s easy. 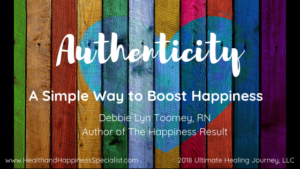 Here are some basic tips on how you can unleash your authenticity and become happier. Wear your favorite colors. Color is a powerful tool that effects our minds and bodies. Color psychology dates back to the ancient time of the Egyptians and Chinese. Notice how it makes you feel. Pay attention to your energy level. Note your confidence and productivity level that day. Be aware of how others approach you. Listen to how you talk and respond to others. Try this for 7 days and notice how much happier you feel by just allowing your inner self and authentic-self to shine through. If you need more ideas and inspirations on how to express yourself, get my book, The Happiness Result. My book contains seven pillars that can help you lead a happier and more meaningful life. To learn more about it, visit www.TheHappinessResult.com . I remember it well. It was two months ago during my family’s summer vacation with my husband and three boys. It’s been a tradition since our boys were school-age. And even though our oldest lives in an apartment and our middle is in college, they still look forward to our annual family get-away. I love seeing the excitement in their eyes when we start discussing details of our trips. This year our vacation destination was Montreal, Canada. Our 6-hour drive was a breeze. We stopped for a country breakfast in New Hampshire and listened to a Harry Potter audio book the rest of the way. Montreal had changed since I was there last in high school. This time it seemed bigger and busier. We fell in love with Montreal right away because of the mixture of the new and the old buildings, the quaint little restaurants, and the majestic churches. It was a fantastic city to experience on foot. We delighted walking around the city. Then one day it happened. My family and I were walking from one end of the city to the next and a sweet and warm feeling consumed me. Out of nowhere, I said to my husband that I felt content. At that very moment, it felt like all the stars were in alignment. The skies were blue, a gentle breeze was blowing and I was there in Montreal with my family. That moment has embedded itself deep into my heart and mind. One of the definitions of content that I found in the Merriam Webster Dictionary is a feeling of being satisfied. That was exactly how I was feeling that day. Even though, I knew there were areas in my life that still need improving, there were bills to be paid, and I was getting older by the minute, my awareness of them did not cloud how blessed I felt in that very moment. How is contentment different from happiness? While both contentment and happiness have been used interchangeably, they are different. The biggest difference between these two feelings is that contentment is a delicious blend of appreciation, mindfulness, satisfaction, and connectedness. It is long lasting. Happiness on the other hand is a more dynamic state of being and is often short lasting. Here’s how you can gain more contentment in your life for the next seven days. Stop and look around every chance you get. Notice what you have, what’s working well, and appreciate it. Look around at the people who make your life better. State your contentment to yourself or to another person. In the next seven days, I invite you to slow down enough to savor all the goodness around you. When you do, you will find magical moments of contentment that can bring so much richness to your life. If you need coaching on how to cultivate contentment into your life, contact me for coaching at info@HealthandHappinessSpecialist.com . Your goodness is waiting for you. Do you remember the last time you fell and got up quickly? While most people instinctively get up as soon as they fall, seniors are not so fortunate. Many aging people have a difficult time getting up after they have fallen because they are too weak or they’ve injured themselves. Falls are the leading cause of nonfatal and fatal unintentional injuries by people age 65 and up (CDC, 2016). According to the Center for Disease Control and Prevention there were 27,000 seniors that died as the result of falling in 2014. Further, 1 in 4 elderly report that they have fallen. This number is staggering! Our body is always changing. The population that is impacted the most are the elderly. As we age, we unfortunately get slower, more frail, and weaker making it more and more difficult “to do the things that we used to do.” For these reasons and many others, it’s no wonder that the elderly develop a fear of falling. While the physical factors that I just mentioned may contribute to a senior’s fear of falling, there is also a mental factor. The belief that falling is inevitable. This powerful fear also contributes to falling. The more someone is afraid of falling, the less they want to move around. The less active they are, the more deconditioned they become. The weaker they are, the higher likelihood is that they will fall. In other words, the fear of falling becomes a self-fulfilling prophecy! My 83-year-old father got into the habit of walking with a cane. It happened as a result of needing an easy-to-use device to help him move around due to swelling of his legs. Soon enough, he became dependent on the cane and lost his confidence in walking without it. Even though, the swelling stopped and his leg condition improved, he still held on to that cane for fear that he might fall without it. During one of his doctor visits, I suggested that he ask his physician for a physical therapy consult so that he could strengthen his body and build endurance. After weeks of exercises with his physical therapist, my dad became stronger and steadier. He’s become more active and more confident about his ability to move around by himself without a cane. It worked! What’s a physical therapist? It’s a highly trained licensed health care professional whose job it is to “help patients reduce pain and improve or restore mobility”, according to the American Physical Therapy Association. Depending on your needs, a physical therapist may be able to work with you to a point that you may be able to reduce your pain medication needs or even avoid surgery all together. There are several fall prevention tips that are useful and practical. However, the one that is not often used is requesting one’s doctor for a physical therapy consult. I believe it’s an overlooked and underutilized specialty for prevention because it is usually associated with rehabilitation. It’s worth noting that physical therapy has an important place in fall prevention. It’s not to say that aging adults should not join a gym or an exercise group. Of course, they should. As long as they have the consent of their doctor. If you know a senior who is afraid of falling, one of the best tips is to inform that person that he or she can ask their primary care physician for physical therapy. This request will notify their doctor of their concern and will make it a part of their routine evaluation every visit. If physical therapy is not indicated, then ask for information on an exercise program that can improve their condition. The first day of the Fall season has been named Falls Prevention Day. 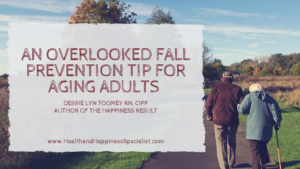 This year, it is September 22, 2018 in order to bring increased awareness and education to the seriousness of falls for the aging population. To find out more about resources for the elderly, contact your local Council on Aging. It’s good to note that while the elderly do fall, it doesn’t have to be a part of aging. There are many ways to prevent it from happening. It’s never too late to set goals for yourself, no matter how old you are. If you need professional coaching on how to live a healthy and happy life, contact me at info@HealthandHappinessSpecialist.com.